OUT OF WATER? WE PROVIDE 24 HOUR SERVICE! Our family has been active in the water well industry since 1885, providing the highest quality wells systems for homes, farms, and industry. We put that experience and well-drilling knowledge into every water system we install and service. Adding a water well to your property is a wise and resourceful investment that you’ll want to have handled properly from start to finish. We offer free estimates that are complete, and you can feel confident that we will be on time and do the job professionally. We are licensed, and insured; guarantee our work, and pricing is always reasonable and fair. We handle pump installation, repair, and replacement for both commercial and residential customers with unparalleled 24/7 customer service. The amount of water you will need will depend upon the size of your home, the amount of lawn and garden watering, and future watering needs. At a minimum, we like to see a well produce 10 to 15 gallons per minute. If you are planning to irrigate your lawn or garden on top of daily functions you should have about 20-25 gallons per minute. Typical domestic water wells range from $2,500 to $15,000 but very deep or complex wells can cost much more. The pump system and installation costs will be determined by the depth of the well and the gallons per minute the well produces. What is a Pump System? A pump system includes everything to get your water from your well to your house. In other words it will consist of a pump, motor, control box, pitless adapter, pressure tank, pressure switch, pressure gauge, check valves, well cap or seal, drop pipe and submersible wire in the well, pipe and wire from the well to the house, fittings and one or more yard hydrants. Groundwater is water below the surface of the land that fills the spaces between grains of sediment and rocks or fills cracks and fractures in the rock. Mother Nature has made the rocks of the earth as a natural storage place for our groundwater. According to the National Ground Water Association, each day, over 130 million Americans get their drinking water from groundwater. Water Wells is the leading provider of well drilling and water well pump service in southern Wisconsin. Our family has been active in the water well industry since 1885, providing the highest quality wells for homes, farms and industry. We are a family owned business who has been drilling wells here in Wisconsin for 5 generations. 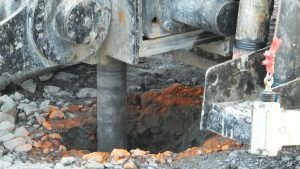 We put that experience of well drilling knowledge into every well we drill. LEARN MORE ABOUT WATER WELLS, INC.